The Beans Blog: My Puttanesca Photo !! 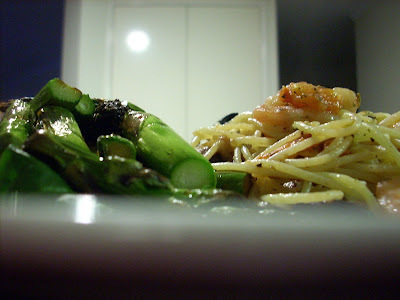 If you haven't tried my Mom's Shrimp Pasta Puttanesca, you need to ! NOW !! I made it last night and it was soooo delicious !! The smell as you cook it is enough to make you want to give everyone else a piece of bread and just sit down with the whole pot !! I left out the anchovies because when I was chopping them up they had bones in them ! We decided we won't bother with them next time ! AND I used normal tomatoes because I couldn't find anything called Plum Tomato and I had normal ones in the fridge !! Oh, and I sliced, rather than chopped the garlic. I LOVE BIG BITES OF SLICED GARLIC !! I served it with Asparagus/Spring Onions on a bed of fresh spinach. I tried this recipe with regular tomatoes a time or two as well. They cooked down into a juicy sauce more than I wanted. Plum tomatoes are also called roma or Italian tomatoes. They are oval shaped and are more meaty than regular round ones. I had thought if I used round ones again that I might cut out the seeds and just use the meat and see how that went. I highly recommend trying to find boned anchovies and using them once before you decide for sure not to bother with them. They add an amazing kick to the flavor. It was such an awesome taste for so little work,eh?